A growing shortfall of building tradesmen in NSW is sending new housing costs surging upwards and blowing out construction times, according to veteran Sydney housing developer Peter Icklow. Mr Icklow, who runs Monarch Investments Group, warned that the battle among developers and builders to secure skilled labour was intensifying and could send some builders broke, derail the current housing boom and make a joke of Premier Mike Baird’s ambitions to build 640,000 new homes by 2031. Mr Icklow said the cost to build the remaining 70 of 352 homes at Monarch’s $158 million Ingleburn Gardens Estate in Sydney’s outer south-west had risen 20 per cent over the past six months, and the time taken to complete a home had increased from five months to eight or nine months over this time. “We are finding that tradies are bidding builders and developers against each other to obtain the best price for their services,” he said. Data tracked by the two peak housing industry bodies, Master Builders Australia and the Housing Industry Association (HIA) – which this week ranked NSW as the premier homcbuilding state, above WA – confirms a growing shortfall of skilled tradesmen in Sydney and regional NSW. The Junequarter Master Builders National Survey of Building & Construction found that it had become harder to access skjlled labour across ^ key building trades. “The results of the survey show builders having difficulty finding higher-skilled workers like site managers, foremen, supervisors and project managers, as well as some of the trades, particularly carpenters and bricklayers, and, increasingly, tilers and concreters,” said . HIA chief economist Harley Dale said its latest internal quarterly figures showed without doubt that the availability of skilled tradespeople has tightened considerably in Sydney and in regional NSW as the housing construction boom continues. He said the trades worst-affected were bricklaying, carpentry, ceramic tiling and plastering. “Since about [the] middle of 2013, we have moved from a situation where there was a modest surplus of skilled labour in NSW to where there is now a net shortage, and it’s deteriorating,” Mr Dale said. 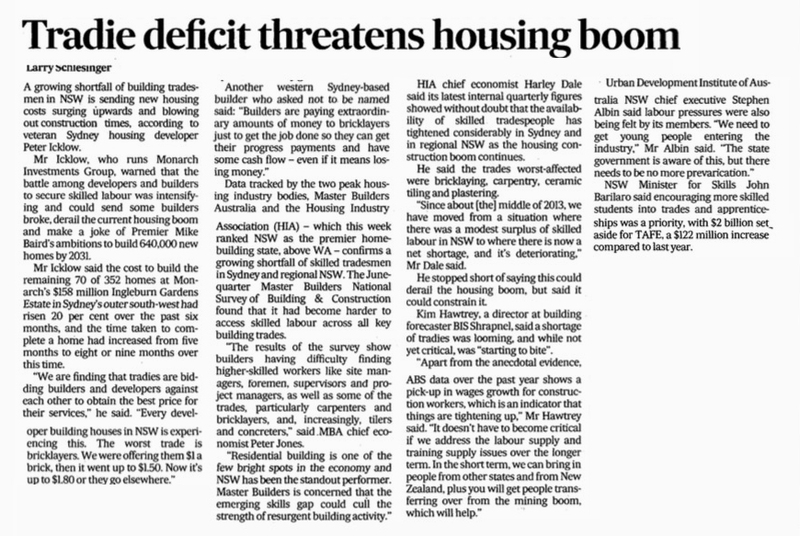 He stopped short of saying this could derail the housing boom, but said it could constrain it Kim Hawtrey, a director at building forecaster BIS Shrapnel, said a shortage of tradies was looming, and while not yet critical, was “starting to bite”. “Apart from the anecdotal evidence, ABS data over the past year shows a pick-up in wages growth for construction workers, which is an indicator that things are tightening up,” Mr Hawtrey said. NSW Minister for Skills John Barilaro said encouraging more skilled students into trades and apprenticeships was a priority, with $2 billion set, aside for TAFE, a $122 million increase compared to last year.